The widely-acclaimed Godfather of Soul, James Brown, who has died aged 73 from pneumonia, was one of the most influential figures in contemporary music. A song-writer and singer, he helped originate funk and provided the roots for rap music. Brown was fondly called by many as “the hardest working man in show business,” Soul Brother number one” and “Mr Dynamite.” His dance styles and arrangement influenced several music greats from Michael Jackson to Fela Anikulapo Kuti. Brown was one of the first musicians to be inducted into the American Rock and Roll Hall of Fame alongside the likes of Chuck Berry. He won his first Grammy in 1965 for “Papa’s Got a Brand New Bag,” his second for “Living in <?xml:namespace prefix = st1 ns = "urn:schemas-microsoft-com:office:smarttags" />America” in 1987” and his third was a lifetime achievement award in 1992. An ally of several US presidents and a confrère of African American leaders, his influence in the community was such that his TV appeals for calm after the assassination of Dr Martin Luther King in 1968 played a vital part in defusing a potentially explosive situation on the streets of America’s inner cities. James Joseph Brown Jr was born on May 3, 1933 in a one-room shack in Barnwell, South Carolina, at a time when America was not only going through its worst economic era but rabid racism was also the norm in the Deep South. Sent away to live in the red-light area of Augusta, Georgia, at aged four by his parents. To help support the relatives who were looking after him, the young Brown became a shoe-shiner, cotton-picker and a street dancer. Life on the street meant trouble and little formal education. He was convicted of armed robbery at age 16, given eight to ten years by the judge; he only served three years at a juvenile detention centre. It was while he was serving out his sentence that he met Bobby Byrd, the head of a gospel group, who helped secure his early release and who became a lifelong friend. Brown tried his hand in professional boxing and baseball before a leg injury put paid to any successful sports career. He then turned his attention to music, singing in a gospel band called “The Gospel Starlighters” alongside Sarah, who was Byrd’s sister. After seeing Fat Domino and Hank Ballard at a blues club, both Brown and Byrd became enchanted with the glamour associated with secular music. They formed their own band, naming it The Famous Flames. Their first recoding, “Please, Please” was released in 1956 and soon became a hit, selling millions in the process. The Famous Flames was a collection of disciplined singers, dancers and multi-instrumentalists, who were soon led by Brown himself and he was also the main song writer for the group. James Brown and The Famous Flames soon became James Brown and the J.Bs, with the likes of Williams “Bootsy” Collins, Fred Wesley and Maceo Parker as anchors. As Brown’s fame grew so did his on-stage antics, which now encompassed his famous twirl and spins, flowing cape and immaculate costumes as well as the grunt. His 1962’s self-financed “Life at The Apollo” is widely considered as one of the greatest life concert records ever. By the late 1960s, when the civil rights movement was at his peak, Brown had become a cultural revolutionary, owing to his message of black pride and black entrepreneurship. The song “Say it Loud – I’m Black and I’m Proud” reverberated throughout the Black Diaspora. But Brown also courted controversy within the Black community when he performed for the US troops fighting in Vietnam at a time when Mohammed Ali, the world heavyweight champions was jailed for refusing to serve in the war. The 1970s were not so generous to Brown, his son Teddy was killed in a car crash and by the middle of that decade Brown’s influenced began to wane with the dawn of Disco music but a cameo role in the Blues Brothers in 1980 revived his career. With the advent of rap music, hip-hop looked up to James Brown for inspiration, becoming the most sampled artist ever. Many hip-hop legends acknowledged that there would have been no rap music without James Brown. But Brown’s personal life was also turbulent, he was arrested for assault and served two years of a six-year jail sentence in 1988 for illegal possession of an armed gun. He overcame these demons and living to the billing of “the hardest working man in show business” he was, until his death, performing dozens of concerts throughout the world every year. An ardent philanthropist, Brown contributed to many black causes in and outside America. He is survived by his fourth wife, Tomi Rae Hynie, and at least four children. 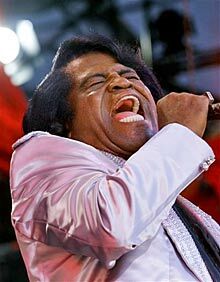 James Brown, Music Legend and the Godfather of Soul Music; Born on May 3, 1933; Died on December 25, 2006.